The album release of “Forbidden Broadway: Alive & Kicking, The UN-Original Cast Album” was celebrated with a CD signing today at the Drama Book Store. 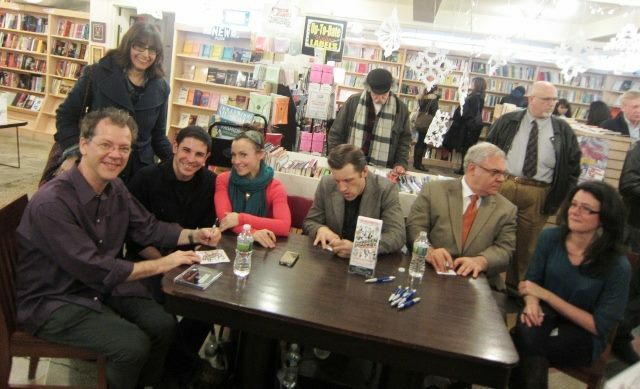 Writer, creator and known genius Gerard Alessandrini joined the cast of the show, Marcus Stevens, Jenny Lee Stern, Richard Foster, Charlé Ellis and David Caldwell in signing CDs. This is the 12th album of the Forbidden Broadway franchise and if you have any affection for theatre at all you’d have most of them. Have a listen then leave a comment telling us what you think!